Anna became an HHMI postdoctoral teaching fellow on February 1, 2012. A biochemistry major, Anna received her undergraduate degree from Mills College in Oakland, California. Afterwards, she arrived at the University of Minnesota to attend graduate school. She researched the herpes simplex virus with Stephen Rice, an associate professor in the Microbiology, Immunology, and Cancer Biology (MICaB) graduate program. After earning a her MICaB Ph.D., she stayed at the University, researching cryptococcus neoformans (a pathogenic yeast) in Kirsten Nielson's lab. 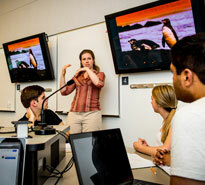 Anna developed her science teaching skills at the University of Wisconsin (River Falls), teaching introductory biology. This was her first attempt to use the active-learning strategies she had practiced at a First IV workshop in Colorado just prior to her teaching position at Wisconsin. Wanting to continue to develop her skills in this area, she became an HHMI postdoctoral teaching fellow. Anna worked with fellow HHMI postdoc Bao Vang to create an oral microflora lab module for BIOL 1010 Human Biology. In this lab, students analyzed DNA from bacteria swabbed from their own mouths to learn about the diverse array of bacteria in the oral cavity. Her current project will give non-major students the opportunity to conduct authentic research on the human physiology. She is working with HHMI postdoc Mary Williams to bring this project to Jane Phillips's BIOL 1010 Human Biology course. This authentic research experience will allow students to design and conduct experiments using iWorx hardware/software, which is capable of measuring things like brain activity, heart rate, lung capacity, eye movement, and muscle twitch. Anna is hoping to present data on the oral microflora and the human physiology lab at the 2013 Annual Meeting for American Society for Cell Biology (ASCB) in December. Anna has also been working with current HHMI postdoc Mary Willams and former HHMI postdoc Brian Gibbens on educational research about quarter vs. semester-based academic years. 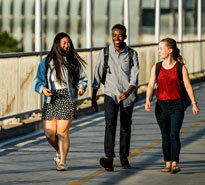 They will present the results this summer at the 2013 National Meeting for the Society for the Advancement of Biology Education Research (SABER). After her HHMI appointment, Anna would like to teach science as a tenured professor at a small college or university.